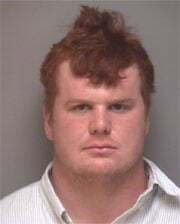 University of Virginia football players… For stealing beer… At the Gay Bar!!! I know everyone is commenting about the hair. Well, that is the biggest crime here, isn’t it? And in honor of the most recent transgression, I just have to show this one more time….. WARNING: COULD CAUSE SERIOUS PSYCHOLOGICAL DAMAGE TO CAR ENTHUSIASTS! It had to happen sooner or later. First known real-world smash-up of the much vaunted all-electric Tesla roadster! Sad!!! The owner had just bought the thing a few hour before. It apparently got rear-eneded by a Camry, which shoved the sloping front end under the Mercedes 2000S. The Tesla’s airbags didn’t deploy because the force of the crash was diverted to pushing the Tesla under the Mercedes. Heck, maybe the sporty wedge design is a better safety feature than we thought. Crumple zones??? Who needs crumple zones!!! Here is the accident from another angle. Yep! That’s a first class wedgie!!! And here is the Camry. All in all, the Tesla held up pretty well. And think about this – since there is no combustion engine, there is no delicate cooling system radiator to damage. If the steering was not knocked out of alignment and the battery pack remained intact, the driver could pop it in reverse, get out from under the Mercedes, and drive over to the bodyshop. I do wonder, since the car is touted as being “green”, are the body panels that will get junked biodegradable? Hat Tip: Leo Laporte and Wired. Next Linux Install? E-Live "Full Version"
As most of my friends know, I am a Linux addict. Right now I have two different types installed on my laptop, Linux Mint, and 64 Studio. Both operating systems are based on Debian Linux, the most prevalent type of Linux out there. Both use the Gnome desktop. I’m in the mood for change (hmmm, change – why does that sound familiar). I am going to replace the Mint distro with E-Live Linux. OK, E-Live is also based on Debian, so there’s no change there, but the window manager featured in this distro is different – it’s Enlightenment. Enlightenment is designed to use less resources than the Gnome Desktop, so my laptop, an old pentium 4 HP Pavilion 5570, will run faster using this OS. Why is “faster” important? I graduated from college in 92 with a degree in telecommunications, with an emphasis on media production. Back in the day, we didn’t have digital video editors, and I have decided it’s about time I learn how to use one. In this case, I have chosen Cinelerra. Video editors are very resource intensive programs, and Gnome hogs those resources. By using the Enlightenment based E-Live, my computer will be able to run this program in a more efficient manner, freeing up memory and CPU for video editing. Besides that, Enlightenment just looks soo darned cool. One other thing that’s interesting about E-Live, is that it is a full featured OS that can be run without installing it on your computer (Take That Windows!). I had played with the demo version of this OS when they introduced it a few years ago, and it was very good then, now it’s time to give it another go. But this time I’m going to install the full version. It will be fun to play with. Stay tuned. If You Can't Stand The Radeon…. It’s not due to Global Warming, thank God. Rush – They're So Old, They can't even get through "Tom Sawyer", their own song! PS. Sorry guys. You know I love you. San Francisco Held Hostage – Day 33! The Standoff Is Over – IT Adim Hands Over Password! Terry Childs, the man holding the city of San Francisco hostage for 32 days, has kindly handed the city’s computer system super-secret password over to Mayor Gavin Newsom. In Person Even!Â I must be getting cynical in my old age; I get the feeling this was all a staged stunt to help Newsom’s run for governor. Maliciously damaged the system themselves? Is he accusing the city staff of purposefully screwing up their computers for the express reason of making his job harder? Yeah, because he SEALED EVERYONE ELSE OUT!!! How about the trial judge…. You know, I almost buy the argument, but for the fact that keeping the password to himself and cutting of administrative access, causing non-functional government, is almost certainly more dangerous than a dysfunctional government, which is the status quoe. It’s what we have always dealt with in our every day lives. PS. I retract my retraction. Childs DID have a prior criminal record. San Francisco Held Hostage – Days 29 – 32! I was traveling and wasn’t able to follow this compelling story. Luckily, nothing of note has happened in my absence, so you didn’t miss anything. In case you missed this compelling story, here is the background. Weapons of Mass Destuction… or is that Construction? Another radical Palestinian idiot has staged a terrorist attack using a bulldozer, but this attack was not as successful as the first one, only three people were reported injured. And this terrorist, like the first, is very much a former terrorist (I hope the 72 virgins are lepers – no offense to the leper community). This attack was staged just outside of the Hotel where Presidential candidate Barrack Obama is to stay. It’s not clear, but one can assume, the location of the attack was chosen because of this. Welcome to the Real Middle East, Mr. Obama. PS. If this would have been Hillary, you can bet some time down the road you would hear her tell the story about how she bobbed and weaved her way through an angry army of terrorist driven Killdozers during her peace mission in Jerusalem. Hell, you’ll probably hear her tell that story reguardless. PPS. The internet can be a strange place. I just found this site titled “Killdozer Visits The Holy Land!”. I’m pretty sure it was created well before these attacks took place. Prophetic? Or was this some kind of veiled message from Osama? PPPS. It’s a good thing this hasn’t happened in the U.S. Someone would certainly be sueing Caterpillar by now. San Francisco Held Hostage – Day 29! Ooooh. I have a source with “Direct Knowledge“!